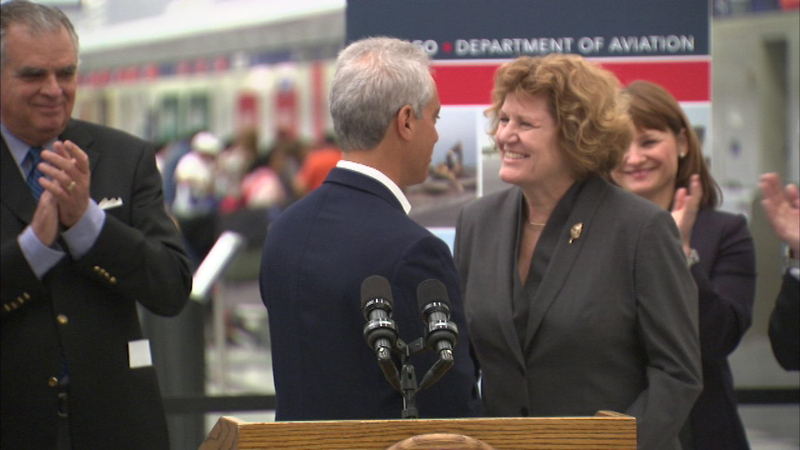 Mayor Rahm Emanuel introduces Ginger Evans as Chicago's new aviation commissioner at O'Hare International Airport in May 2015. CHICAGO (WLS) -- A woman who oversaw airport construction projects in Washington, D.C., has been named Chicago's new aviation commissioner. Mayor Rahm Emanuel announced Ginger Evans' appointment on Sunday. She'll assume her new job supervising operations at Midway and O'Hare International Airports on June 1. Rosemarie Andolino announced her resignation to enter the private sector last year. She oversaw the sometimes obstacle-laden modernization of O'Hare. Evans' main mandate is to make O'Hare and Midway more competitive. Emanuel said in a Sunday statement Evans understands airports are "economic drivers" of cities. Former U.S. Secretary of Transportation Ray LaHood led the search for a new commissioner. Evans most recently served as vice president of engineering at the Metropolitan Washington Airports Authority. Her prior jobs included director of aviation for Denver International Airport.